Gotta say, having a skim through some of the proposals and visions for that site, i'm impressed, particularly at the positive outcomes for public open space, will link nicely to the Botanic Gardens. I think North Terrace is a very unique asset to Adelaide, even more so once these visions have been realised. And yes would love the Adelaide Contemporary to be part of that mix. So what is currnetly getting built here once this is demolished? I’m a little confused. Nothing confirmed yet. Depends what type of indigenous gallery get built .... an amended version of the winning competition design (desirable) or a totally new design (bad ... would delay the process by a further 12 months). I'm not a fan of Marshall's unhealthy obsession with building a glorified cooking school on the site (TAFE training). This is the most prime real estate Adelaide could offer. Some would kill or die for this land. A cooking school is not fit for the site. ABOUT 1000 people are expected to be working at a new business hub on the old Royal Adelaide Hospital site by next year and clear signs of progress will be obvious by Christmas, Premier Steven Marshall says. Mr Marshall, touring the Lot Fourteen site with The Advertiser this week ahead of a large digital training and networking event there on Wednesday, also confirmed space set aside for start-up businesses and innovation will more than quadruple to 23,500sq m after strong market interest. He has also released new artist’s impressions of development plans for the site, which including revitalising old outpatient and theatre block buildings set to host a new culinary school which will replace Regency Park’s ageing Le Cordon Bleu facility. An artist’s impression of the redeveloped Lot Fourteen, the old RAH site. Mr Marshall said he was determined not to overspruik what would be achieved at the site, but insisted there was already clear evidence that it was drawing entrepreneurs who would create jobs and maintain vibrancy in the East End. More than 500 people are now at the site, including SA Pathology and new tenants Chamonix IT Solutions and Myriota. Early next year, a further 300 people will join the site with the University of Adelaide’s Australian Institute of Machine Learning. It is understood 40 more businesses are looking at establishing business operations at the old RAH site soon. The Government has also earmarked a heritage building to host the new national space agency if SA’s bid is successful, and believes having established offices ready to go significantly enhances the offer. Mr Marshall, who’s taken personal control of overseeing the site’s development, last month appointed former defence company chief executive Jim Whalley as the state’s first chief entrepreneur. He will operate from the old RAH and is in charge of organising regular business training and networking events. Wednesday’s Google-run “digital garage” is being billed as a “soft opening” for the tech precinct. Mr Marshall said he was “absolutely confident” the expanded commercial space, for which firms are paying market rent, would be filled and a CBD precinct with organised access to training and potential investors would be a big drawcard. “There is really very little like this anywhere in Australia, where you have a curated precinct which is focused on start-up, scale-up and innovation,” Mr Marshall said. 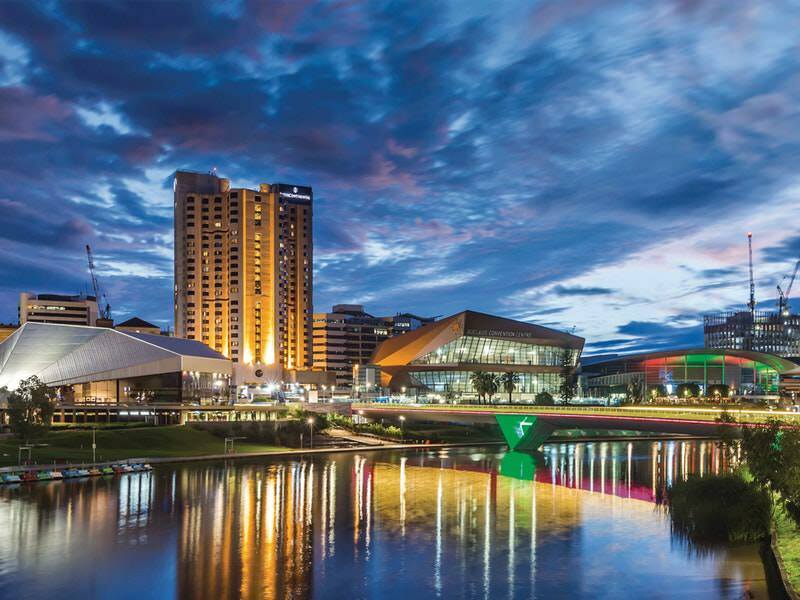 “This will really create a very compelling offer, not only for start-ups from SA but I think attracting a lot of global companies’ innovation and research capability to Adelaide. He said the Government was keeping an open mind about how to use remaining parts of the huge 7ha site. Old RAH tenants will be able to engage in joint projects with operators at the Tonsley Park innovation hub, but the two sites will be run separately. “We do not want this to become the next Le Cornu North Adelaide site, sitting there as a symbol of this state’s stagnation,” Mr Marshall said. “We want this to be a symbol of our transformation as a state into future industries and jobs for the next generation. THE first tenants of the city’s new creation and innovation site at the old Royal Adelaide Hospital say they will be able to connect to global companies such as Microsoft and Amazon after moving in. Chamonix IT Solutions and Myriota will bring a workforce of more than 100 people, specialising in big data, cyber security, defence and space technologies, to the 7ha site now called Lot Fourteen after moving onto the premises this week. Chamonix director Scott Grigg said his company, which works with organisations to achieve and maintain digital currency – said the move would let Chamonix work with some of the biggest players in the industry, worldwide. “Our new location at Lot Fourteen will create more opportunities to connect and collaborate with both local and global partners, such as Microsoft, Amazon and Adobe,” he said. Myriota is an Adelaide-based satellite communications company that specialises in low-cost Internet of Things connectivity. Chief executive and co-founder Dr Alex Grant said the move would coincide with 50 new jobs being created over the next couple of years for the company. PREMIER Steven Marshall wants under-promising and over-delivering to be a hallmark of his new government and is urging people to judge it by what it does, rather than what it says. Perhaps nowhere will that test be more visible than at the old Royal Adelaide Hospital site. It has been apparent for more than a decade, since the great shift from one end of North Tce to the other was announced, that there would be a golden opportunity on the huge city block that’s now referred to as Lot Fourteen. With health services shifting out, a prime site nestled between the Botanic Gardens and universities became a blank canvas to be painted. Walking around the site this week, it’s very apparent that things are changing. Demolition of buildings that are past their use-by date and the refit of iconic heritage buildings on the corner of North Tce and Frome Rd, started under the former government, continues apace. A smattering of techies toil away at computers, workmen were preparing for today’s Google event and the shell of an office for a chief entrepreneur is taking shape. A long-delayed tram occasionally rolls past, in testing for the unknown day when it will take actual passengers. Infrastructure plays a very important part in SA’s politics. Labor for years made great play of the revolution on the Riverbank as evidence it was “building SA” and moving the state forward. Similarly, the vacant Le Cornu lot in North Adelaide became a sign of stagnation. For people unsure of what a government is actually achieving, seeing is believing as structures like Adelaide Oval, a big battery or desal plant become symbols of priorities and progress. Mr Marshall has mapped out a clear plan for what he wants to achieve at the old RAH, while constantly stressing he wants to keep a lid on his own excitement and public expectations. He says there’s a clear weariness across an SA community that’s seen PR spin like the Olympic Dam expansion or Gillman gas hub come to nothing, with political “overspruiking”. Mr Marshall’s pledge at the election was for a business start-up hub, new international culinary school and Aboriginal art and culture gallery at the old RAH. All are supposed to be started by the next election. There’s also now hope the new Australian space agency, and serious commercial businesses from across the globe, could take major footprints there. It will be easy for people to judge success or failure, simply by having their own poke around at a massive public site on a major city boulevard that’s just impossible to hide. It looks like there isnt a hotel site which is a shame. The earlier proposal by C&G [with Labour govt] I thought was a better fit with an international hotel overlooking the Botanic gardens etc. Last edited by how good is he on Wed Sep 26, 2018 9:52 am, edited 1 time in total. Still thoroughly underwhelming. "Tech incubators" could be literally anywhere, and the absurdity of gifting the culinary school to Le Cordon Bleu who were already planning on investing their own money on a North Tce new build. Contemporary gallery, gone; concert hall, gone. What's going to attract people not working in the hubs and culinary school? The aboriginal gallery sure isn't going to be a big attractor, especially for repeat visits. The tech incubators and Aboriginal Art Gallery are not especially visionary but are at least appropriate uses. The culinary school, however, is absurd. As Nathan says, why throw public money at something private money was prepared to do? But moreover, if it’s to be a public endeavour why not make it transformational? The only way I see a culinary school achieving that on this site is if it’s collocated with the University’s oenology and food marketing courses and leverages the Botanic Gardens to create a centre of excellence for the food and wine industry. But IMO, I’d rather see a culinary school situated in the Central Market to capitalise on its status as our premier visitor attraction and food/produce destination. Whilst I agree this proposal is quite underwhelming, it does exactly what Labor's proposal wasn't going to do. Put upwards of 1,000 people on that site every day to refill the void created by the departure of the RAH. You also have to remember these points: Le Cordon Bleu scrapped their plans for North Terrace after years of trying; defence and tech industries are a long-term stable tenant considering all of the recent projects handed to SA; the concert hall wasn't properly funded and it went against the long-term vision of what would have been its main tenant, the ASO; and finally, you completely underestimate the value of Aboriginal culture which perhaps you might need to revisit the South Australian Museum (Aboriginal artefacts makes up a bulk of its displays). I agree that it should be a contemporary gallery on this site vs an Aboriginal gallery (there should be room for both), I also would agree that the chosen design is among the worst put forward. But at the end of the day, these plans should only be looked at as short-term, this site can always be reinvigorated again in time. Pretty much my thoughts. Plus, what happened to the vision for 24/7 activation? This site is likely to be dead after 6pm when everyone's knocked off. I feel a contemporary gallery would probably have more scope for out of hours events than a more traditional style aboriginal art and cultures gallery. Mona does a great job at out of hours activation. I also get the impression that Le Cordon Bleu isn't all it's cracked up to be and doesn't have the best reputation in the culinary world. Hopefully they'll improve their standards if they move to swanky new accommodation. Underwhelming and a colossal disappointment on what it should be. Patrick I agree with your points except the part about The Cordon Bleu school scrapping their plans. They (with C&G) recently submitted and got approval for a major $200m + development at 200 North Tce. I question now what will happen to this development. Anyone know? Yes, the approval was literally only a few months before Marshall announced his plan — they surely must have known about it.